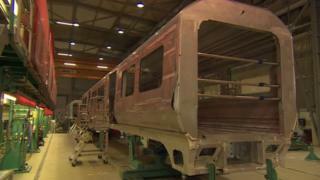 A rail operator is to abandon trains costing £200m which are currently being built in Germany. First MTR, which was awarded the South Western franchise on Monday, is committed to a fleet of 90 new trains to increase capacity on the Reading, Windsor and London routes. It will, however, reject 150 Siemens carriages ordered in 2014. Instead, the operator is commissioning further new trains to replace them on a cheaper annual lease. The German trains will enter service in April and can carry an extra 8,000 commuters each day. The substituted cheaper carriages will arrive from 2019. At the same time, newly-refurbished carriages which currently run to Reading are being dumped, together with other suburban rolling stock which is currently in the middle of a full technical rebuild. It's a bit like walking into a car showroom, and being offered a brand new car from the factory for less money than the identical demonstrator that is already sitting in front of you ready to go. The bottom line: hundreds of carriages worth hundreds of millions of pounds are simply being dumped. The cost of borrowing has tumbled, new manufacturers are competing for orders and production lines are already set up. That makes a new train cheaper even than one that is right now half-built. Who pays for the ones that are left behind? Ultimately we all do, through the fares we pay. The new and refurbished carriages, which can only be used on southern England's third rail system, are destined to sit on sidings indefinitely. First MTR, a partnership between First Group and Hong Kong metro firm MTR, said it could not yet be interviewed due to a non-disclosure agreement. It will take over the seven-year franchise from Stagecoach on 20 August. The Department for Transport said: "First MTR has committed to deliver 750 new carriages by the end of 2020 which will offer more space and improve journeys for passengers on the Windsor, Reading and London suburban routes. "It is for First MTR South Western to decide how it uses its trains."